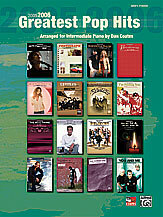 Accessible intermediate-level arrangements of the chart-toppers from 2005 and 2006. Titles: Beautiful * Because of You * Believer * Boulevard of Broken Dreams * Breakaway * Emotional * Everything Burns * Good is Good * I’m Feeling You * Inside Your Heaven * Like We Never Loved at All * Lost Without You * Magic Works * No More Cloudy Days * Over * Photograph * Ready to Fly * The Real Thing * Stranger in a Strange Land * Untitled (How Can This Happen to Me?) * Wake Me Up When September Ends * When You Tell Me That You Love Me * Window to My Heart * You and Me. 104 pages.